Have you been trying to push yourself to be more productive? Are you still not getting as much done as you’d like to? Are you still feeling stressed out? There are a lot of shoulds in our life when it comes to productivity. For example, I’ve always been an overachiever and somewhat of a work-a-holic. Looking back at my life, I see that I often start out doing what I love, but I end up hating it, because I force myself to work more than I want to, and more than I need to. There’s a divine flow to life. Going too fast is no better than going too slow. It has taken me a while to realize that it is okay to not get everything done at once. It’s okay if you’re not where you want to be right now. At the same time comes the realization that the process and the journey is what life is all about. And that is why I always recommend you follow your highest excitement from moment to moment. The milestones are cool, but enjoying the process is what makes a difference. 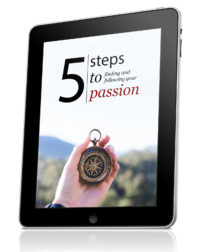 When I was working on Live Your Passion, I eliminated 95% of all other tasks. I didn’t write as many blog posts. I spent less time on social media and I didn’t take on anything else that came my way. You don’t have to do all the things you think you do. Often if you step back and take a look at your life, you will see that you can eliminate a large percent of stuff that doesn’t make a difference. When you read and learn too much, you start believing that you have to follow other people’s paths when the only path you have to follow is your own. Elimination means saying no to projects that do not resonate with you. Elimination means that you are okay with doing less, but getting more done. This is counter-intuitive, because we equate productivity with constantly doing something, even if that something is checking e-mail every five minutes. But real productivity just means doing things that matter without killing yourself. When you eliminate, you get focus. If I didn’t eliminate as much as possible when I was working on Passionate Living (one of my earlier courses), I would not have got it done in 2 weeks. Each day I woke up, I knew that the only thing I had to work on was my ebook. That gave me clarity and eliminated procrastination, because the task was so simple. If I feel overwhelmed, I take out a pen and a piece of paper the night before I go to bed. I write down three tasks I am going to focus on the next day. For example, I may write down three chapters I want finished. You have to listen to yourself and find your own rhythm. The most important part is how you feel. Remember, even if you’re doing something you’re passionate about, or building an online business, if you’re working too hard, you’re stuck in another cage. I’ve always been very impatient. I can’t wait to get things done, but I’ve come to realize that there’s never an end. When you finish one thing, there’s always something else. I saw this clearly when I played poker. At first, I wanted a certain sum of money in my bank account. When I hit my goal, I wanted more, and more, and more. The cycle never ends. It’s how our minds work. Remind yourself that it’s okay to have less, work less and relax more. If you want to enjoy life and get stuff done, you have to rest. Action and rest are two sides of the same coin. One cannot exist without the other. If you work hard for a long period of time, plan in some rest. Don’t jump into the next project right away. I’ve done this the last few weeks. I’ve focused on improving my Spanish, practicing martial arts and hanging out with interesting people. Productivity doesn’t mean you have to work, work, work. It just means that you have to focus on that essential 20% that gives you 80% of the results. Listen to your heart, breathe and relax. I keep working on simplifying my life, a little bit at a time. My to-do list is now usually pretty much centered around things that really matter and the number of possessions I have is decreasing. Progress is slow but steady! I can identify with what you shared about impatience .. you’re right, there is never an end. I am trying to practice being in the moment and focussing 100% on what I am doing so as not to jump ahead all the time. As you said, there is something else to do waiting there for us anyway! Divine flow … I like that idea and I think you’re right, if we take the time to listen we know what the right thing to be doing is. It’s tough to focus 100%, at least for me it is. I find myself always wanting to check my e-mail or do something else, but once you bring your mind back a few times, it gets easier and easier. Meditation has become an “Essential Ingredient” for me in staying productive. Even small moments of 30 seconds can help refocus and energize. Thanks for sharing this Henri – great stuff! Thanks for reading and commenting, Frank! I really appreciate it. Meditation definitely is beneficial, even in small doses as you said. Just being still and breathing for one minute can make a big difference. The more you do it, the less time you need. I think focus and action really where it’s at. I notice that when I turn off distractions for 3-4 hours I can get an INSANE amount of work done. I”ll end up writing something like 3 blog posts in an hour and doing a bunch of other stuff. I think there’s also something called operating while you are in the zone for optimal productivity. I’ve written a post about this (but haven’t published yet, but i’ll link your post here to it :)). Thanks again for doing the interview. It’s amazing how much I get done when my internet isn’t working. Good stuff, I really liked eliminating what wasn’t important. That is something we can all be reminded of. Also, I had no idea it just took you 2 weeks to finish your ebook–Wow! I think I was able to write it in 2 weeks because I already had the information in me. It was all personal experience, so I just had to get it out. This is quite meaningful to me right now because I’m working so hard to get my self improvement website off the ground that I actually feel burnt out some days. I’ve got visions and I want them to happen, but I’m finding it challenging to just accept the position I’m in and let the universe decide when my success will come. You shoot yourself in the foot if you work too much, regardless of how much you want your dreams to manifest sooner. Thanks for helping me realise this! I know where you’re coming from. You want results and you want them know. Keep working and you will sooner or later get to where you need to be. Another excellent post. I often see colleagues who think to work hard you have to be running around like a headless chicken jumping from unfinished task to unfinished task when the trick is to relax a little, taking things one step at a time making sure each task/job is completed properly (saving time and problems in the long run). It’s a form of procrastination when you keep doing busy meaningless tasks. It’s tough to focus and do the work, but that’s what really matters in the end. Couldn’t agree with you more, Moon! Damn, two weeks for an ebook! This is inspiring to know because I have an ebook that I’ve been wanting to write for some time now but the thought of writing a book, frankly scares me. I guess I’m concerned that it will become this big monstrosity that will take over my life for months. I guess not, huh? Congrats again on the new ebook! The cool thing is that you don’t have to create a large ebook right away. You can keep it small and if people like it, you can add to it. Finding balance in life seems to be the key and one of the most difficult things for people at the same time. It is much easier to go to different extremes, such as getting nothing done or becoming a workaholic, which usually leads to burnout sooner or later. Finding the correct balance in life is in my opinion quite an interesting topic, as my own personal problem has been quite the opposite of yours: I used to find it really hard to get things done in the past without any huge external motives. I had to push myself to be able to play poker for two or three hours a day when I did that for living. In the end, I don’t think it really matters if a project is finished in three weeks or in seven weeks (unless someone else decides about the deadline) – how can we even know that we are alive after seven weeks? Finding the right balance helps to make every day enjoyable and allows us to live in this moment and not just dream about the things we get after we have reached a certain goal. Yup. You and Rework are on the same page, my friend. This is an incredible piece you have put together here. I can identify with the work-aholic lifestyle. At the beginning of the year, I set out on a journey to simplify, and while not completely there yet, I am finding much more happiness and peace in those simple moments. Thanks for sharing such value. Totally agree on the elimination front. At first I planned to write the LHG in the off time from translation work; an hour a day or something. But that would have taken most of the year to get through! So I blocked all work – turned off my chat programs and generally said “no” to as many distractions as possible. Meant that I could get the whole thing done in just a few weeks. And you reminded me of something important I need to get on right away: rest – I should get out and appreciate the post-launch buzz some more! Henri – found your stuff through Blogussion and really enjoy it. I’m with you on the doing less to get more done. I suffer from procrastination by doning – take on way more than I’m capable of getting finished and then bounce back and forth between projects. It allows me to always have the excuse that I’m too busy to complete things. Seth Godin (and really Steven Pressfiled in “The War of Art”) call this “the lizard brain.” It tells us to focus on unimportant things like email or just reading blogs so we can avoid doing the work that is important. In my case it manifests by doing to much and not getting anything done. Thanks for the reminder to refocus.